Chongqing Municipality, (formerly Romanized as Chungking), is situated at the convergence of the Yangtze and Jialing Rivers, and is the leading river port and industrial hub of the upper Yangtze River basin. Chongqing separated from Sichuan province in 1997 to become China’s fourth provincial-level municipality after Beijing, Shanghai and Tianjin. Chongqing is bordered by Sichuan to the west, Shaanxi to the north, Hubei to the east, Hunan to the southeast, and Guizhou to the south. At an area of 82,000 km2, Chongqing is slightly smaller than Austria. The municipality of Chongqing is made up of 19 districts, 15 counties, and 4 autonomous counties. The official abbreviation of the city’s name is Yú, which comes from the olden name for the part of the Jialing River which flows through Chongqing into the Yangtze. In 1938, the city of Chongqing became the war time capital of the Chiang Kai-shek’s Nationalist government during the 1937-45 Sino-Japanese War. Between 1938 and 1945, Chongqing’s population swelled from less than 250,000 to more than 1,000,000 as hundreds of government offices, foreign embassies, factories, universities and schools moved to the city to shelter from the Japanese that were fighting inland from China’s coastal provinces. Chongqing suffered from heavy aerial bombardment at the hands of the Japanese during this time. Because of this relocation, Chongqing was rapidly transformed from a small inland port to a heavily industrialized city. Known for its dense fog which covers the city for over 100 days a year, its weather provided the city with additional protection from Japanese aggression. 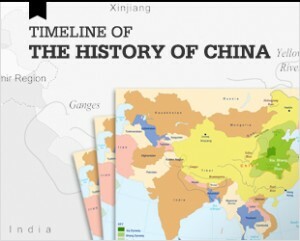 In 1946, as Civil War engulfed China, the Nationalists shifted their capital back to Nanjing. Three years later, when the Communists captured Nanjing, the Nationalists fled first to Guangzhou and then back to Chongqing before eventually retreating in defeat to Taiwan. After assuming power, the Communists invested heavily in rebuilding Chongqing, large parts of which had been destroyed by more than a decade at war. They also significantly expanded the city’s military and industrial base. Mao believed Chongqing’s geographical remoteness provided good protection for its defense industries in the event that China was again attacked. As a result, Chongqing grew steadily during the Communist era. In more recent years, Chongqing has been at the forefront of China’s ‘Go West’ strategy, designed to advance its western economy which has lagged behind the development of the economy of China’s coastal east. 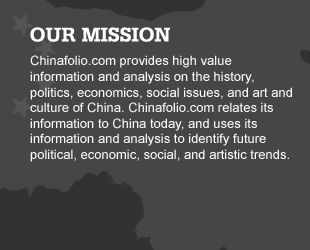 The main elements of the Go West strategy include the development of western China’s transport, hydropower, energy and telecommunications infrastructure- between 2000-2006 over $163 billion has been invested in infrastructure alone, ecological protection and reforestation, the recruitment of foreign businesses, and investment in education. Even more recently, the municipality has become known for the downfall of Communist Party member Bo Xilai. Bo Xilai won national recognition for his efforts to crackdown on organized crime in Chongqing, for his expansion of low-cost, modern housing for Chongqing’s poorer residents, for his Maoist-style campaigns designed to revive red culture and ethics, for his courting of foreign investment, and for his surveillance operations that targeted the communications of even top Chinese leaders, including president Hu Jintao. Bo’s fortune turned in 2011 when British citizen Neil Heywood was found dead in a Chongqing hotel room. His death was linked to Bo’s wife, Gu Kailai, who was eventually convicted of his murder in August 2012. On 15 March 2012, Bo was dismissed as Chongqing party chief. In September 2013, Bo was found guilty of bribery, abuse of power and corruption after the most high profile trial in China for almost forty years. He is currently serving a life sentence in prison. Although approximately 30 million of Chongqing’s residents are still farmers, Chongqing is rapidly urbanizing; it is estimated that as many as 1,300 people move into the city daily. Chongqing has also overseen the resettlement of residents dislodged by the Three Gorges Dam, and has absorbed a large number of the more than one million displaced when the Dam’s reservoir began filling. While Chongqing had established spinning, weaving and silk-reeling mills, and glassmaking and cigarette manufacturing plants by turn of the 20th century, its heavy industrial development did not begin until 1938 when the Japanese invasion caused China to relocate many of its factories to the area. These heavy industries thrived because of Chongqing’s abundant natural resources including coal, iron ore, bauxite, strontium carbonate and manganese. 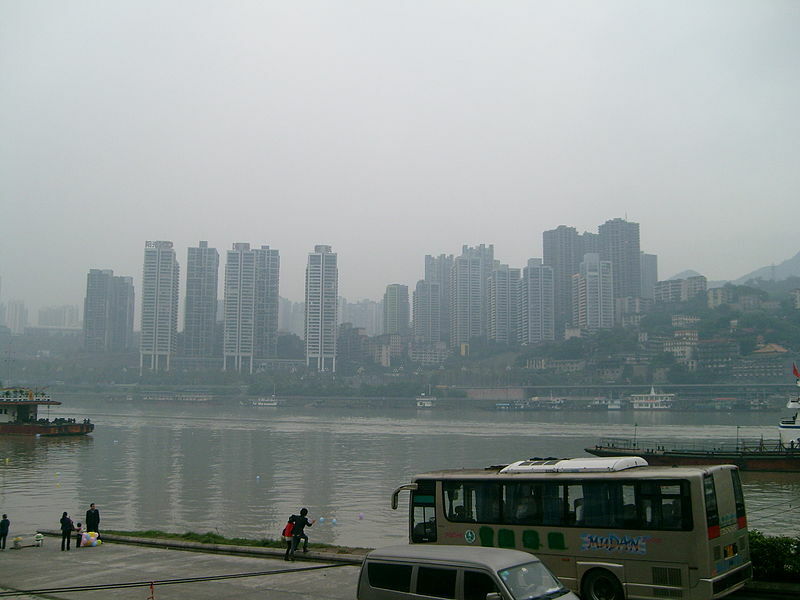 Chongqing also has about a fifth of China’s natural gas and has excellent hydropower capacity. 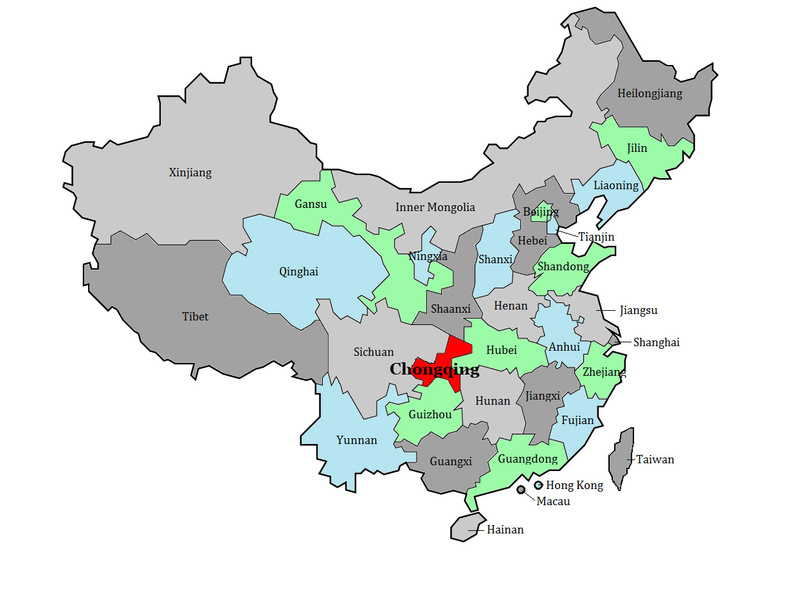 Today, Chongqing’s industrial base is significant, although unlike eastern China, its export sector is small due to its inland location. Instead, its factories produce primarily for the domestic market. Chongqing’s iron, steel and aluminum plants are among China’s largest. Chongqing is now China’s third biggest motor vehicle producer and China’s largest motorcycle manufacturer. Other heavy industries include machine, farm tool and munitions factories, chemical, petrochemical, pharmaceutical and fertilizer plants. Chongqing’s light industrial manufacturing includes cotton, silk, paper, leather goods, electronics, food-processing and lacquer ware. 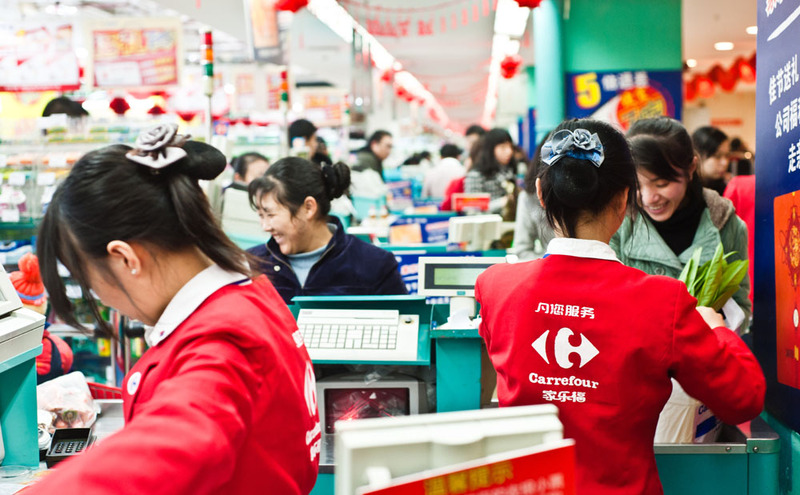 Since the 1990s, Chongqing has invested with goal of moving its economy up the value chain by shifting its production towards high technology and knowledge intensive industries. To expedite this, it established the Chongqing New North Zone. A large number of scientific enterprises now reside there focusing on industries such as electronic information, bioengineering, and new and advanced materials. Its financial and insurance sectors have also been rapidly growing. Chongqing is located at the convergence of the Yangtze and Jialing Rivers, to the east of the Qinghai-Tibet Plateau. Its land is traversed by mountains including the northern Daba, the northeastern Wu, the eastern Fangdou, the southwestern Wuling and the southern Dalou. Its entire geography slants southward toward the Yangtze River valley, although its many mountains ranges camouflaging this slope by rising and falling in sharp peaks and valleys. The Yangtze River courses through Chongqing from west to east, carving through the Wu Mountains to form China’s famous Three Gorges of Qutang, Wuxia and Xiling. 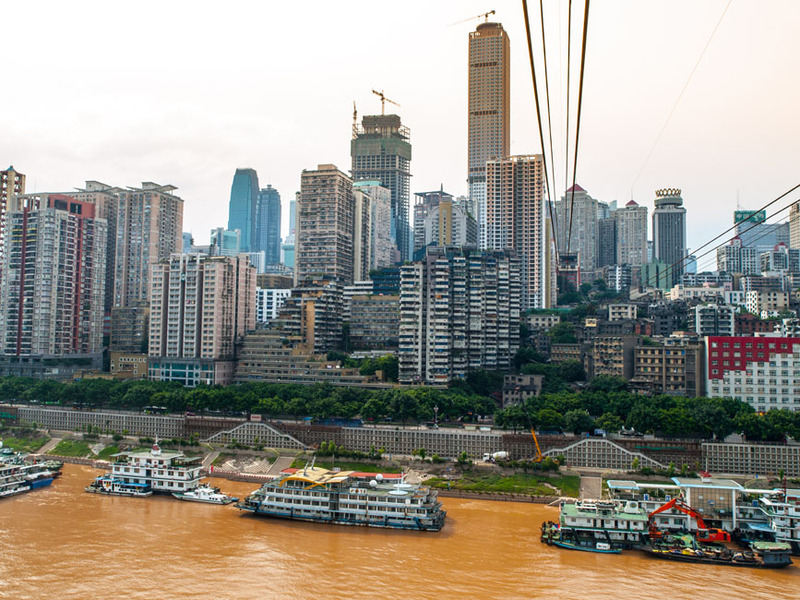 Running northwest through the Gorges of Libi, Wentang and Guanyin, the Jialing River merges with the Yangtze at the heart of Chongqing’s urban center. The Wu River, a tributary of the Yangtze, flows along Chongqing’s southwest before heading into Guizhou. Over time, these rivers have worn away the region’s limestone, forming karst landscape features including stone forests and limestone caves. Shielded from the cold northern winds by the Qin Mountains in Shaanxi, Chongqing has a subtropical, monsoon-influenced, highly humid climate. Known as one of the Yangtze River’s three furnaces, its summers rank as one of the hottest and most humid in China. 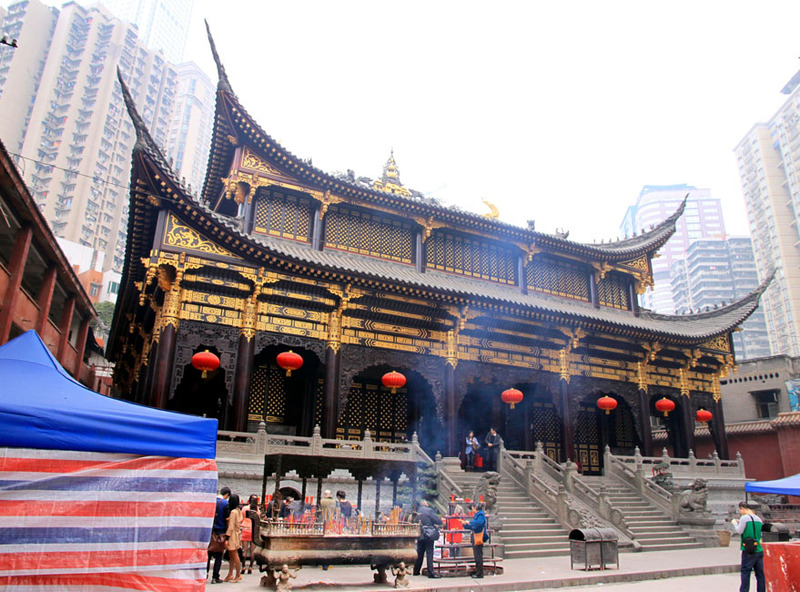 Of interest in Chongqing City is the 1000 year old Arhat Temple and Hall – now squeezed between two skyscrapers – showcasing interesting rock carvings and a corridor of 500 terracotta sculptures of arhats (enlightened beings who are passing to nirvana upon death). Huguang Guild Hall – an ancient, beautiful complex of buildings that once acted as a community center for peoples coming from Hubei, Hunan,- Guangxi, and Guangdong. The Yangtze River Cable Car and City River Cruises both offer ways for visitors to see the city from perspective; the River Cruises are especially beautiful at night when the city is awash with light. Ciqikuo Ancient Town, west of the city center, gives some sense of what Chongqing City must have been like before the Japanese invaded and its expansion began. Baolun Si is one of its Ciqikuo Ancient Town is one of its few remaining ancient temples. Finally, the Three Gorges Museum gives you information on the Three Gorges Region, the minority people populating the area, and the dam’s construction. 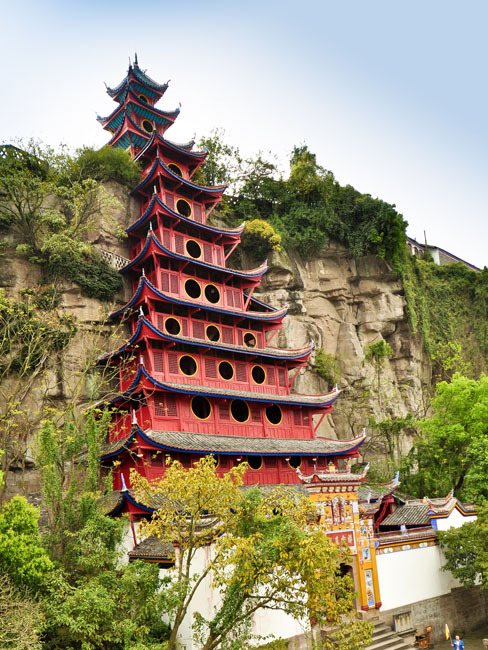 Outside of Chongqing City in Zhongshan, Chongqing’s once commonplace stilt houses can still be viewed. Built mainly on bamboo frames, they were originally intended to keep families together despite Chongqing’s uneven topography by building vertically instead of horizontally. Their thin mud and straw walls were designed to increase air flow during the summer. Songji, situated next to the Yangtze River, provides a chance to explore a Ming-era village, replete with cobbled streets, courtyard homes, teahouses and temples. Laitan is a 1000 year old walled village located by the Wu River. It is full of interesting shops and good restaurants. It is distinguished by a 13th century, 14 meter tall Buddha carved into a hillside which is flanked by more than a 1000 smaller statues. 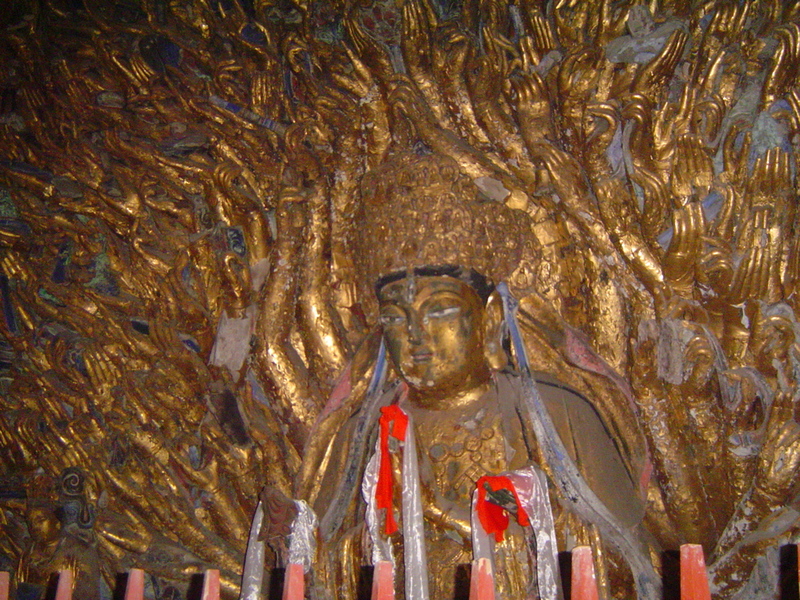 Close by the Buddha is the village temple.